Glistening and resilient, the swim and fitness spa shells are made to deliver years of reliability and enjoyment. Reinforced with hand-laid fiberglass, this exceptionally strong shell is built by Americans in the heart of Pennsylvania. The high-gloss scratch resistant acrylic surface by Lucite® in Sterling Silver Marble or, the newly introduced Tuscan Sun Marble, is known for its decades of lasting strength and signature good looks. In a sea of look-alikes, the M Series Cabinet™ stands apart with stylish accents. The all-weather, fade and stain resistant synthetic PermaWood™ cabinet may look like it belongs in a galleria, but is made with your home and outdoor in mind. 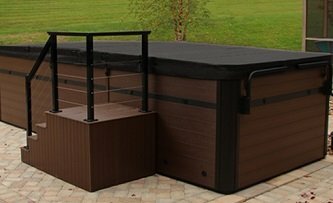 Available in two rich earth tone colors, Smoke Gray or Willow Brown, the sleek parallel black accent band and matching corner columns separate these swim and fitness spas from all others. Consider the optional Eclipse LED Lighting to highlight the cabinet with soft down glow from black wall sconces. Leave your operating cost worries behind! All swim and fitness spas include an ASTM approved locking safety cover constructed with marine grade vinyl and solid foam preventing heat escape, thereby reducing operating costs. All swim and fitness spa covers are in a rich black color complimenting the black cabinet trim for a sophisticated, classic look. View covers and cover lifters. PDC Spas offers handcrafted cabinet matching stair units for convenience and safety, not to mention adding to the already good looks of your swim or fitness spa. Built wide and sturdy, this 4 tier unit offers a closed stair design, complete with black posts and stainless cable rail. Shown here in Espresso Brown, also available in Graphite Gray, both matching the versatile, weather resistant PermaWood™ cabinet finishes.